Every year on the first Sunday after St George´s Day (23 April), the March for England takes place in Brighton. Some people mark it in the calendar as a celebration for Englishness, others cross it as a racist and fascist event. 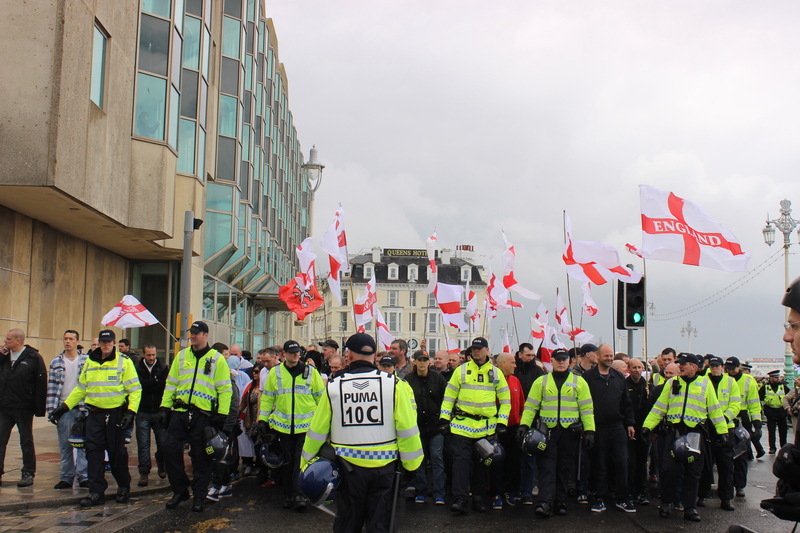 It brings to the city nationalists from all across England to march, local anti-racists and anti-fascists groups to counter-protest and security forces from all around the country to keep both groups apart and avoid clashes. However, it seems no much of joy and celebration. Hundreds of security forces confine the nationalists in a police line, then there are vans, and policemen on horses on another circle and finally barriers are displayed along the seafront to maintain both groups as much apart as possible. In the city the rejection to this march is generalised. The main parties in the city held a meeting weeks before the event took place calling to ban or move the march to somewhere else. Their message was clear. ”Please, don´t come here. It is not about politics. Your union does not represen the city and you are causing trouble“, affirms Lianne De Mello, from the Green Party. Parties and community groups state that the march only causes problems for residents, diversed communities that feel intimidated, disruptions for tourists, business and public transport as the march takes place in the centre. Last year, the police operation cost £500.000. The stand that the police has taken is to maintain the same route as previous years. “The police keep them in one place to know where they are. So, they cannot cause much trouble. They march and then they head back to the train station and leave the city at the end of the day until the next year”, concludes De Mello.